The Tax Justice Network is supporting global partners in highlighting the impact of regressive tax policies and financial secrecy on women’s fundamental human rights, something we campaign on and write about. Here’s some information about the #TaxJustice for Women’s Rights Global Days of Action. The dates for your diary are 8-24 March 2017. 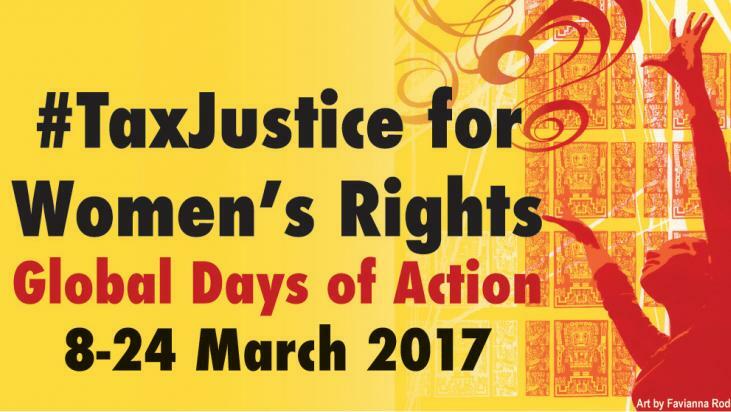 Start planning your creative actions to promote #TaxJustice for Women’s Rights in the Global Days of Action, 8-24 March 2017. Join with women’s rights, trade union and tax justice groups in your country to understand the issues and plan joint work together. Let us know what you’re doing! Please fill out the SUBMIT EVENT form. International Women’s Rights Day, Wed. 8 March 2017 – Join people around the world as we launch the Global Days of Action for #TaxJustice for Women’s Rights, and call on our governments to stop the global scandal of corporate tax dodging, end illicit financial flows, and transform inequitable fiscal policies in order to fund and fulfill women’s rights. Wed. 15 March – ActionAid International will release a new report on macroeconomics and violence against women. Watch for and share the report. Attend the UNCSW parallel event 15 March @ 8.30am, Church Center of the United Nations, New York. Thurs. 16 March @ 6.15pm – participate in the #TaxJustice for Women’s Rights’ forum, Hardin Room, Church Center of the United Nations, New York. *This UNCSW parallel event is jointly hosted by the Global Alliance for Tax Justice, Global Unions, Association for Women’s Rights in Development, Center for Economic and Social Rights, Oxfam, ActionAid, Tax Justice Network, Christian Aid, National Taxpayers Association Kenya. World Water Day, Wed. 22 March 2017 – stand in solidarity with Public Services International members. Tell our governments to ensure the Human Right to Water is realised through universal access to public water services that boost women’s health and economic independence. I must appreciate you for this campaign. Am atax justice campaigner.and this is what am going to involve the team at Women and Girl Child Development Association to benable part of other organisations in Uganda.